First of all my sincere congrats with Paint.Net!!! Super program! Thanks for making such a neat cool graphic tool! I hope you don't mind making a suggestion: a transparency setting in the Paintbrush tool. I really miss this option. The Hardness setting works fine, but it does not fade the paintbrush hence becoming softer. Transparency setting/slider would. Hi Jenna, welcome. I'm new as well so excuse me if I ge this wrong. I tried several paint programs and I like Paint.net most of all! Anyway, I tried the suggestions and it works (many thanks! ), but one thing is a bit cumbersome; the opacity always returns to 255 when changing color (or using the color picker) and the Color window does not remain "more" (the options you get when pressing 'more') after you close Paint.net. It does not "remember" the 'more' setting. Jenna the size of the Colors Window is a trade off of functionality vs the canvas size. By default the window is closed - allowing more space for the canvas. Unfortunately you cannot get the larger size to persist between Paint.NET sessions. RE: Opacity: You can set up a default palette with customized RGB and Alpha (opacity) settings. See how some palette colors have a checkered effect? That's an indicator that these have partial opacity. The color picker tool should pick up the opacity of the pixel you click on. Just to enhance off of what EER is talking about, there are two icons in the Colors Window, by using these icons you can make your own color palette, but remember to save the palette or the new colors won't be there next time. 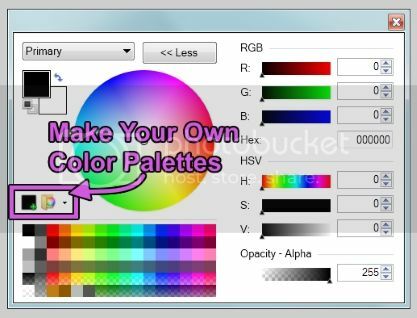 You can make your color palette out of many different colors and various transparencies, including Alpha 0. However, you are limited to only seeing the first two rows unless you click "More", but adjusting to the need of toggling between "More" and "less" starts to feel like second nature the more you get used to your new work flow habits. It is a nice features those custom palettes! Thanks for the help everybody. However, It will not make editing quicker when you are trying to smudge (by combining Hardness and opacity) the faults of a drawing away. For example, you have a face and you are trying to erase all the faults away making it a perfect face. When you do that using the colorpicker and the paintbrush tool it will take many actions switching between colorpicker and opacity setting (because the transparancy is not a fixed variable). I easily do 50 color picks for a simple edit hence 50 times changing the opacity value manually. This is also a reason why I can not use a custom color palette because one never knows which colors I will need. I hope I explained it a bit better. Sorry to necro this thread, but I've ran into the same workflow issue as Jenna, had to switch to a more heavyweight app in the end. Given that paint.net already has brush hardness, it should be trivial to add opacity (scale hardness function) I think, which would make the paint tools more powerful. I wouldn't even mind to contribute (code-wise) if there was a way. 1. No necroposting, no matter the reason. Since you apologized, you know it's wrong. It's been over a year. Don't do it. Start a new thread instead. 2. Come on, man. Never tell a programmer something should be "trivial" - you don't know the codebase or program architecture, you have no idea. For all you know, it would take a complete rewrite of the program and a precise alignment of Mars and Jupiter to make it happen. 3. If you want to contribute, write a plugin. It wouldn't be able to interact directly with the canvas, but building a "sub-canvas" that then writes to the main canvas is not only possible, but has been done before.